The MDX Lead function is used to navigate between same level members and returns the members at the specified position. For example, If you want to navigate to particular member then we can use this LEAD function. TIP: In MDX, Lag Function with Negative value is Equal to Lead function with Positive Value. If we use Zero as the Member_Position then Lead Function will write the same Member_Expression that we mentioned before Lead function. If we use Positive Value as the Member_Position then Lead Function will move forward to specified value and returns the Member_Expression at that position. If we use Negative Value as the Member_Position then Lead Function will move Backwards to specified value and returns the Member_Expression at that position. NOTE: The Lead Function is used to navigate between same Members level. For example, If we mentioned City member as Member_Expression then Lead function will navigate between remaining Cities, it will not go Level Up (State – Province) or Level down (Postal Code). In this article we will show you, How to write Lead function to navigate both forward and backward with examples. For this, we are going to use below shown data. In this example we will show you, What happen when we use Zero value for the Lead Function. 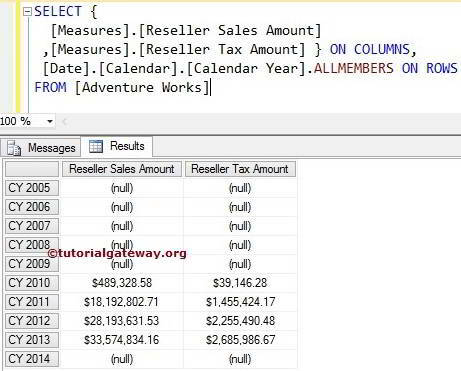 The following query will return the Reseller Sales amount and Tax amount of the Calender Year 2013 itself. In this example we will show you, How to find the Range using Lead function. 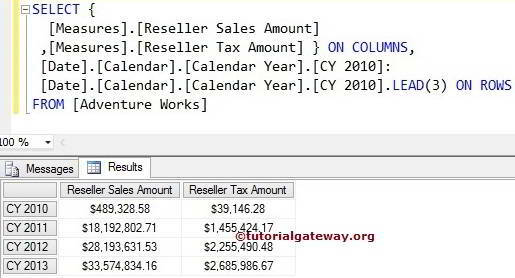 The following query will return the Reseller Sales amount and Tax amount from Calender Year 2010 to 2013 because we used the range symbol (:) between [CY 2010] and [CY 2010].LEAD (3).